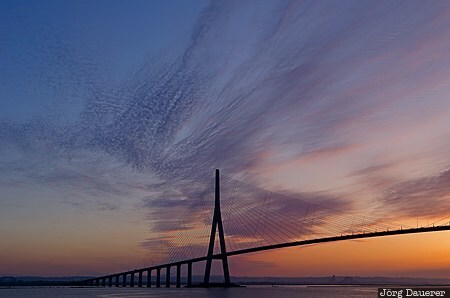 The impressive 2143 metres long cable-stayed bridge Pont de Normandie which spans the river Seine linking Le Havre to Honfleur in front of a colorful sunrise. The Pont de Normandie is in Basse-Normandie in the north of France. This photo was taken in the morning of a cloudy day in May of 2011. This photo was the image of the month in August of 2015. This photo was taken with a digital camera.